" Our Heavenly Father, the Creator of the universe, has cared at all times for humanity in His unending love. He has guided His people through the Patriarchs and the Prophets. When the people heeded the Will of God and lived according to it, God's blessing remained with it. Yet disobedience was followed by severe consequences. God is leading His people now as well. He pronounces His will through the Church, through her documents issued by the Holy Father under the inspiration of the Holy Spirit. God is likewise speaking through me who I am your Mother. The documents of the Church that the Holy Father issues and my messages are the working of the Holy Spirit. God's blessing is upon humanity and the individuals who live according to the Will of the Father, yet disobedience has severe consequences. Priests, my beloved sons! Know that God is speaking to you through the Church and her documents that have been written down according to the inspiration of the Holy Spirit. Also live my messages that my Son is entrusting to me. Teach men and you will fulfil your responsibility for the souls entrusted to you; you will share in GOD's help and blessing; you yourselves are going to experience the work of God. I pray with you for the obedient and the disobedient, and I bless all who are striving to live according to God's will "
How happy I feel seeing you steadily growing in numbers. I especially bless those who have come from far away and who work so that as many people as possible can hear my voice as well as the Will of the Holy Trinity announced to you through me. I bless also those who endeavour to make my voice heard all over the world. Repeatedly I share with you the Will of GOD that you should work for peace and for unity in the Church. Priests and all of the faithful, you should be at the side of your Bishops Pray and endeavour that the evil spirit who is bringing disunity, disobedience and dissension into the Church will become powerless and without effect. You should be a light, help and support for one another. You should not judge but rather love. Thanks be to all of you who are faithful and who do not take notice of those who take offense at your love, fervor and fidelity to me. Light shows the way out of darkness. I am sad about those Priests who content themselves with their comfort and their errors; who are disunited, given to the goods of this world and even disloyal. You are not to judge them. Pray for them, love them and through your good example show them the way. With great joy I bless all, especially the sick, those weighed down by the cross and my faithful priests who are ever ready to serve GOD and man"
For three years I have been at this place in a special way. For a long time already this place has been belonging to me. All of you who had open eyes and hearts could see and experience my presence and work throughout these years. I promise that with the building of the new shrine on Kurescek, dedicated to the Most Holy Trinity, the Church will also grow and be spiritually enriched. Not only here, but also at many places in the world churches that are already almost dead will revive. Abolish hostility and through prayer, forgiveness and reconciliation bring the war to an end. The month of May this year shall be dedicated in a special way to prayer and activity for reconciliation, so that the heavenly powers may conquer the evil and darkness which are penetrating into nations. Unite yourselves with me, and we will gain the victory. The messages that I give in Medjugorje and Kurescek complete one another, therefore you should accept them as one, as one and the same address from God. Only some of it relates only to Kurescek. The messages are meant for the whole world. Priests, my beloved sons! Today I rejoice especially over all the priests who dedicate themselves to me, surrender themselves into my service and come to me on pilgrimage. A special blessing to me are those sons who, in spite of the offence others take, come on pilgrimage to me to Medjugorje and to Kurescek. Therefore I bless you with great joy, so that you can be even stronger lights and living witnesses of how GOD is pouring out His blessing through me." Together we prayed the Stations of the Cross. 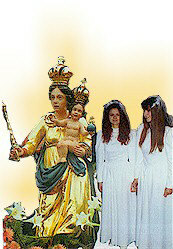 At the twelfth station (Jesus dies on the Cross) the Queen of Peace appeared during prayer. I fell to the ground as always. Mary said: "Behold the love of GOD!" Then she disappeared and instead of her I beheld three crosses with JESUS in the middle and on both sides the thieves. Looking at Jesus, my body transformed itself into a single suffering mass. The pain did not last long, it was covered with a bliss and love that I had never experienced before; this love was not mine, but the LORD's. "This is the love that is stronger than suffering." Then I beheld an unending crowd of people. In front were priests, bishops, religious men and women. Even though they were mingled among the other people, they were the most numerous. "This is the humanity of all the world and of all times"
I then heard the voice of CHRIST: "Father, forgive them, for they do not know what they are doing!" Before me the crosses appeared again and several people standing underneath. A terrible screaming of insults echoed, yet the criminal on the right hand looked at the LORD and said to Him: "Jesus, remember me when you come into your kingdom!" And the Saviour looked at him and redeemed him: "Today you shall be with Me in Paradise." JESUS looks at us, at the whole crowd, and His gaze adheres to one woman, whom I recognize as Mother Mary; to Her right stands a girl and to her left a young man. JESUS said to His Mother: "Woman behold your son!" Then He looked at the young man and the girl and said: "Behold your Mother!" When He was saying this He looked upon the whole crowd. The unknown voice still said: " From now on you have a Mother, and she has you." CHRIST reached out with His hands, as if they had not been nailed, and embraced the whole crowd. After this embrace, I no longer saw anyone, I heard nothing. When I came to consciousness I cried out of happiness, emotion and a special abundance. It was a great happiness to experience the passing terrible pains and the overflowing of these pains in the love with which the LORD redeemed the world. All of this is hard to describe." As you celebrate the greatest events of the salvation history of mankind which take place in front of you, discover with awe the divine mysteries regarding the price which the Father paid to redeem us. I am still calling you and invite you to prayer. Pray and live according to the Gospel. This is the only weapon against evil, only in this way will you solve your problems. Do not admire the beauty of my messages, but accept them and live according to them. Persevere in unity and endeavour for unity within the church. Be united to the priests and bishops. Do not talk about the bad qualities of your priests and spread them. Even if one did not happen to be a good person, as a priest he is an administrator of divine graces. Priests, my beloved sons! Take care that you do not walk behind those sheep that expect stronger nourishment from you. Walk ahead of the sheepfold and listen to those who are hungry and thirsty for prayer and growth in the spirit. Do not look at the majority resting content in spiritual superficiality; rather look to the small number of sheep, even one or two, who want to pray with you and expect help from you for growth in the spirit. These sheep are seeds and a blessing for the parish, they will not stay alone. Open your hearts, so that you may receive the blessing of Easter and my blessing. I give my special blessing to those are disabled, to the sick and abandoned." I am the Mother of the Church, therefore be with me as living members, united to the body, whose head is my Son. Reject all that is growing and fear it. Only by remaining in complete unity with the Church are you assured of the right spiritual nourishment. The part separated from the body is doomed to death. I already invited you to unite yourselves especially in prayer during the month of May and to live according to the Gospel more intensely, for only by doing so will you conquer the dark forces. Wherever you are and in whatever shrine you might be, unite yourselves to me and through me to the most Holy Trinity, in whom is your strength and salvation. Do not fear, we will conquer. A healthy body nourished with pure food is able to resist disease. May 13th is my day in a special way. Be with me this day for at least an hour; let us pray together for the holiness and fidelity of priests and for all those who have made religious vows. Love and pay attention to one another. If one of you becomes sick or falls, do not leave him without help. There shall be no judgement in your hearts, only love heals and lifts up those who have fallen. I am with you, do not be afraid. Only the one who is without a mother is without protection and helpless; he is an orphan, thrown to and from. Stay with me as beloved sons and you shall safe. All of you my children, care especially for the helpless, the sick and the old. You too will be helpless and lonely one day. May my blessing remain with you and give you support. Also help the helpless by bringing my blessings to them." " Praised be Jesus Christ ! The greed for worldly goods, comfort and splendor totally preoccupies man. He has no time for noble deeds, for prayer, he has no time for God. Even the believer remains in a faith that is superficial; the light decreases until it finally expires. Darkness begins to reign and the dark forces attain their goal. Friends become foes and the one who is attacked becomes an aggressor. Families fall apart, good relations with one's neighbour are transformed into tension and fight. Where spiritual darkness begins to reign, pride and the sense of independence from God are growing as well as the feeling of freedom, a freedom that is actually slavery to the dark forces. Once darkness has repressed the light in the heart of a priest or Christian who has already felt the grace of God and who has already received revelation, my pain is even greater! My Son suffers with me in the mystical body when believing victims become aggressors and seekers of unrest and hostility. Therefore I invite you and I call you to live the Gospel and the message God is giving to you through me. Extinguish the fire of tension and disunity within the Church. Kling to the Holy Father and to your bishops. I invite to unity with the bishops, especially the priests, my beloved sons. Because of your fidelity to God, to the Gospel and to my messages and because of your growth in inner depth you will partake in the persecution of judgements, hostilities, insinuations and even lies. Console yourselves with the fact that your redeemer has partaken in all of this and that he does so even today through you. You are not alone, I am with you, your mother and so are my blessings"
I rejoice with you who are close to me that the voice is spreading throughout the world that the Holy Trinity is addressing to the world through me. My advice, my warnings and directions penetrate into the hearts of man very slowly. But I am thankful to all of you who are a shining example. Your obedience to the Gospel and to me is a message to those for whom I am still waiting to open their hearts for the light and the grace coming from heaven through me. I am concerned about all my children who are hindering my flame from shining forth stronger through their unbelief, mistrust and stubbornness. Therefore I invite you to forgive everyone and to pray for them with me. Also be ready to forgive when the arrows of humiliation and accusations strike you. Be vigilant and faithful, for you live in very serious times, but times even more serious are ahead of you. Think about the content of my messages, live according to them and pass them on to others. All of you, my daughters and sons, are collaborators in the proclamation of divine love and grace that the most Holy Trinity is sending through me. This is not a new gospel! This is help from heaven to help you live according to the Gospel and to protect you from the danger which is threatening you. God wishes that all men be blessed. Therefore He speaks through me and pours out His special grace over humanity. Priests, my beloved sons! All of you who open themselves to me and to the messages that the Lord is giving through me are my joy. But I am sad about those who close themselves to the documents written by the Church through the Holy Spirit. Ignorance of the documents of the Church causes obstacles to the new spiritual renewal movement of the Church that wants to protect you from the currents of evil spirits and powers of darkness. I have already made you aware of this. My sons, the priests, I love you. I want to have you still closer to myself, that you may hear my voice better and recognize the divine care, love and grace that heaven is bestowing on the Church through me for the sake of her mission. Come, I am waiting for you. I bless all of you, who are gathered here, as well as those whom you have recommended to me. I bless especially the weak and the sick." My heart is filled with joy, for the little flame of love for the Holy Trinity, to whom the messages which God is giving to humanity through me spurn you on, is being enkindled ever more and more. Spread them all over the world, for the messages are an expression of a special grace of God. "...Spread them all over the world, for the messages are an expression of a special grace of God..."
"...These messages have permanent value. On 24th of September, I will give the last message from Kurescek and for Kurescek. Live and act in accordance with previous messages. From now on at Kurescek I will talk in the form of events. Messages from Medjugorje and Kurescek are priceless. Do not have them forgotten on your shelves, live them. SPREAD Mary's messages TO YOUR FRIENDS. IT'S SIMPLE and IT TAKES ONLY 6 MINUTES OR EVEN LESS of your time !
" Do not worry about those who do not accept you and my messages. Again I say to you: Do not prove the reality of my messages and of my presence and do not convince those who do not take this as true. " Through this grace the hand of God desires to protect you and to direct you and to make you aware of existing dangers. It gives you the means and shows you the possibilities of being inwardly renewed through the power of the Holy Spirit and of successfully withstanding the pernicious forces which are oppressing the Church with great power and deceit. The Church is redeemed and she redeems. Live as redeemed members of her Body and partake in the work of the redemption. The Son of God was offered up for all men. Remain vigilant and promote unity within the Church, with the priests, the bishops and the Holy Father. Resist the increase of non-biblical and non-Christian ideas. The bishops are the custodians of the true faith; you, my beloved sons, are to be their helpers. Hence remain close to them. Unity with your bishops is your wall of protection. Pray, pray, and pray again that you may not deviate from the right path. The rosary is your weapon. Strengthen your prayer through fasting and repentance. Those who do not accept me and who doubt the authenticity of my messages should not be like water on the fire! I am with you with the blessings that God is giving to you through me." There is no true joy without happiness, yet happiness is found in God alone. The one who is with me is in God, for I became the Mother of the Son through God the Father. Stay in my Heart, for only through my Heart will you be victorious. The times ahead of you are not going to be easy, but those who stay faithful to God and myself will conquer. My son, a great trial lies ahead of you. The cross will be heavy, but you will be able to bear it for I am with you. It will be so heavy that it will seem as if the whole world were crushing you, but all will brighten up again. I bless all of you who are here with gratitude and those for whom you pray. May my blessing remain with all those who seek to make my voice penetrate the world. The divine calls and warnings you are receiving are an outflow of divine love, so that all may be saved. You need the strength and wisdom that you can only obtain from one source alone. Listen to the Gospel and to my messages and remain faithful members of the Church. Priests, my beloved sons! I love you. Those of you who desire my closeness and love to visit my sanctuaries are a special joy to me; lead those who are entrusted to you into my Heart. May my blessing come upon you and through you to all people, especially to the sick and lonely"
Beloved daughters and sons! How beautiful it is for us when we are together with sincere hearts and not with insidious intentions. Anyone who does not feel this beauty has not yet come close enough to me to let me embrace him. Let us stay together and it will be more beautiful and easier for you! I once again invite you to pray the rosary. Prayer shall be your weapon and your protection in spiritual warfare. Enjoy praying the rosary, for along with the prayers of Holy Mass it is the central prayer. Presence at Holy Mass and the discovery of the mysteries of the rosary are the summit of prayer and of closeness to God. My son, come here whenever you can. You are not bound anymore to the first Saturday of the month. Often pray in front of the tabernacle where the most Blessed Sacrament is present. I also will encounter you there, especially during times of distress. You will receive my support just as my Son received consolation from an Angel in the Garden of Gethsemane. For it will seem to you that all have abandoned you. Already now I tell you that I will be with you. Pray much and offer up your sufferings for my sons, the priests, especially for those who are too far away from me and in dangerous trials. I bless all my children, those who have a healthy spiritual eye and those who are spiritually blind "
I ask you my children to grasp my messages according to the spirit, not according to the letter. The letter kills and does not allow you to understand well. Ask the Holy Spirit for spiritual understanding. The only reason why there is so much resistance to my messages is that letters are not capable of expressing the true content of my messages. Renounce material wealth, which preoccupies you too much and leads you away from spirituality. You are shepherds! Tend your sheep! Your responsibility is great. Pray, so that you may not fall into temptation. I bless all my children, especially the suffering, the sick and the weak." Praise the Lord and be grateful to Him, for He has called you and revealed Himself to you. Tell the people that on June 10, 1989, I promised you that you would become a priest. At that time there was no hope, yet you trusted in me. My son, you have become my beloved son. From now on you will only receive messages for others occasionally. You will be inspired to write and to say what you should. You are to share this with the people. After some time, you and others will understand what I command you now. This is the beginning of a new mission. Your task consists in prayer and to guard yourself against the temptation to pride and to not distance yourself from the divine will. Be careful that you do not change or take anything away from God's inspirations. More people still are going to seek help from you: but watch out, that you do not act selfsufficiently, in your name alone. The Lord is your strength, wisdom and your knowledge. Offer up all Holy Masses and yourself entirely. Be faithful to the vow that you gave, when you became priest. Be faithful and obedient to God, to the Church and the Bishop and through him to the Holy Father. This will be the source of your strength. I bless you as well as all priests, my beloved sons, and all my children.